Post: Gaurav Akrani. Date: 7/25/2010. No Comments. Label: Management. Market segmentation means dividing the total market for a product into different parts i.e segments on certain bases and using each segment fully for the purpose of marketing and sales promotion. Due to segmentation, each segment will have uniform features and suitable marketing mix can be introduced for promoting sales in each segment. For effective marketing, the total market needs to be divided into suitable segments and exploited fully through suitable marketing mix. This is exactly what is done in segmentation. One marketing mix for all segments will not be effective and for introducing different marketing mixes, segmentation is a basic requirement. Thus, market segmentation means dividing the total market into different sub-markets that have similar characteristics with reference to consumers. The individual buyers within each segment are similar in terms of their wants, expectations and buying power and marketing programme will be drawn for each group in order to enhance consumer satisfaction and sales promotion. This approach of market segmentation is better as compared to the approach of treating the entire market for a product as one entity and use only one marketing mix for the market (market aggregation / mass marketing approach). Market segmentation is a new customer-oriented philosophy and is consistent with modern marketing concept. It studies needs and expectations of different consumer groups and provides something for everybody. This promotes sales and also offers more satisfaction to buyers of that group. Here, the producer employs a 'Rifle Approach' and not the 'Shotgun Approach'. This means he pinpoints the target (customers group) and draws specific plan to meet their needs rather than fixing broad target (all customers) and preparing one general plan to meet the needs of all customers. It is an accepted fact that markets are not homogeneous. Consumers differ in their needs and also the manner in which the needs are to be satisfied. For example, clothing is required by all consumers but all consumers do not wear the same type of clothing. The same is the case with shoes, shampoo, soap, cosmetics and so on. Naturally, manufacturers of each products have to produce different varieties as per the requirements of customers of different segments. According to Philip Kotler, market segmentation means "the act of dividing a market into distinct groups of buyers who might require separate products and/or marketing mixes." According to William J. Stanton, "Market segmentation in the process of dividing the total heterogeneous market for a good or service into several segments. Each of which tends to be homogeneous in all significant aspects." Facilitates consumer-oriented marketing: Market segmentation facilitates formation of marketing-mix which is more specific and useful for achieving marketing objectives. Segment-wise approach is better and effective as compared to integrated approach for the whole market. Facilitates introduction of suitable marketing mix: Market segmentation enables a producer to understand the needs of consumers, their behavior and expectations as information is collected segment-wise in an accurate manner. Such information is purposefully usable. Decisions regarding Four Ps based on such information are always effective and beneficial to consumers and the producers. Facilitates introduction of effective product strategy: Due to market segmentation, product development is compatible with consumer needs as there is effective crystallisation of the specific needs of the buyers in the target market. Market segmentation facilitates the matching of products with consumer needs. This gives satisfaction to consumers and higher sales and profit to the marketing firm. Facilitates the selection of promising markets: Market segmentation facilitates the identification of those sub-markets which can be served best with limited resources by the firm. A firm can concentrate efforts on most productive/ profitable segments of the total market due to segmentation technique. 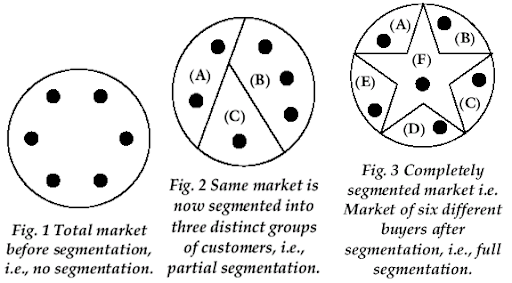 Thus market segmentation facilitates the selection of the most suitable market. 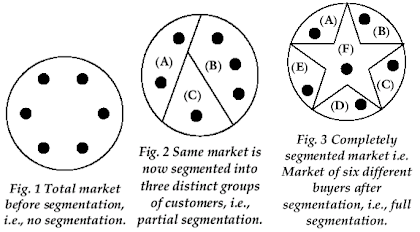 Facilitates exploitation of better marketing opportunities: Market segmentation helps to identify promising market opportunities. It helps the marketing man to distinguish one customer group from another within a given market. This enables him to decide his target market. It also enables the marketer to utilise the available marketing resources effectively as the exact target group is identified at the initial stage only. Facilitates selection of proper marketing programme- Market segmentation helps the marketing man to develop his marketing mix programme on a reliable base as adequate information about the needs of consumers in the target market is available. The buyers are introduced to marketing programme which is as per their needs and expectations. Provides proper direction to marketing efforts: Market segmentation is rightly described as the strategy of "dividing the markets in order to conquer them". Due to segmentation, a firm can avoid the markets which are unprofitable and irrelevant for its marketing purpose and concentrate on certain promising segments only. Thus due to market segmentation, marketing efforts are given one clear direction for achieving marketing objectives. Facilitates effective advertising: Advertising media can be more effectively used because only the media that reach the segments can be employed. It makes advertising result oriented. 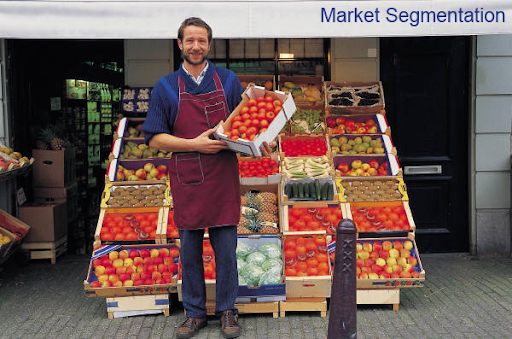 Provides special benefits to small firms: Market segmentation offers special benefits to small firms. The resources available with them are limited as they are comparatively new in the market. Such firms can select only suitable market segment and concentrate all efforts within that segment only for better marketing performance. Such firms can compete even with large firms by offering personal services to customers within the segment selected. Facilitates optimum use of resources: Market segmentation facilitates efficient use of available resources. It enables a marketing firm to use its marketing resources in the most efficient manner in the selected target market. The marketing firm selects the most promising market segment and concentrates all attention on that segment only. This offers best results to the firm in terms of sale, profit and consumer support as compared to the results available from spending such resources on the total market. In conclusion, it can be said that market segmentation offers benefits not only to marketing firms but also to customers. The marketing job will be conducted efficiently and the available resources will be utilised in a better mariner. These advantages also suggest the importance of market segmentation and make a case in its favor. In the present marketing system, market segmentation is a normal rule and not an exception. It enables companies to exploit marketing opportunities fully by using the available resources and also enables them to face market competition with confidence. It enhances marketing efficiency of the firm in each segment selected. No segmentation means absence of market penetration. In short, market segmentation is an important aspect of modem marketing management. It is a must for survival and growth in the present competitive marketing. It facilitates the preparation of separate marketing programmes for meeting the needs of different groups of buyers. Right markets for the right products can be provided through market segmentation. In brief, market segmentation is important not only for creating consumers but also for satisfying them. Market segmentation helps matching of market opportunities to the resources of the corporations and enables them to face market competition effectively. It raises marketing efficiency through proper adjustment of marketing mix for each market segment. Market segmentation is one important element of modem marketing management. Segmentation gives precise answer to the question, "To whom should we sell out products and what should we sell to them?"